Disney’s Contemporary Resort, with its colorful ultra-modern and futuristic design and décor, is a great deluxe resort option for families with small children. It’s no wonder then, that one of the signature character dining experiences in all of Disney World, Chef Mickey’s Restaurant, is located in this resort. Chef Mickey’s Restaurant is in the fourth floor concourse of the Contemporary’s Resort hotel, and like the rest of the resort it is awash in colorfully futuristic shapes and lighting. 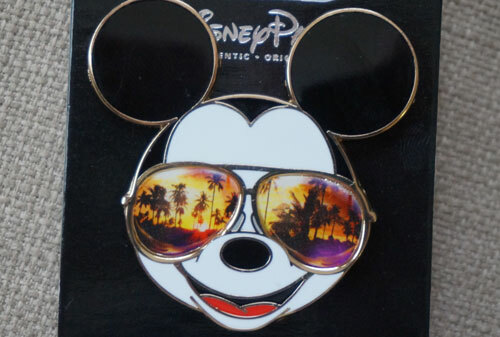 And the image and silhouette of Mickey Mouse, as the name of the restaurant implies, is everywhere you turn. 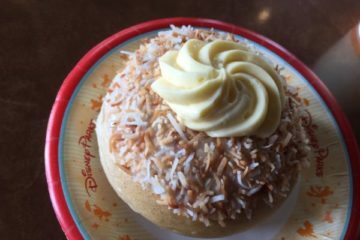 There are a wide variety of Disney character dining opportunities at the Disney World theme parks and resorts, and they are a great way for children to meet their favorite Disney character. Rather than standing and waiting in a long line for the chance to shake Buzz and Woody’s hands or pose with a princess, a character meal allows you to enjoy great food while the featured characters of a restaurant visit each and every table. Because character meals are designed specifically for children, the restaurants that host these interactions have buffets, pre-plated meals, or family-style food that provide a child-friendly atmosphere and menu options. With a few exceptions, character meals are not the places to go for an elegant dining experience or exotic food, but they are great fun all the same! 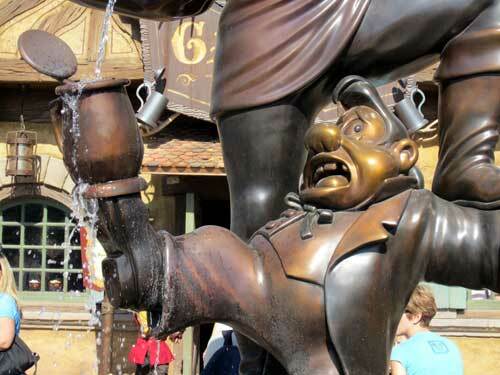 Enjoy a fun buffet with fun Disney characters. Chef Mickey’s has a breakfast and dinner buffet, and will occasionally serve lunch during the busiest seasons of the year. In spite of the informal nature of a buffet, the restaurant and its famous host are so popular that table reservations are required. Due to the high demand for tables, Chef Mickey’s does require that any cancellations come at least 24 hours ahead of time, and cancelled reservations within that time frame will be subject to a cancellation fee. The restaurant is on the fourth floor concourse of the main Tower, a wide-open space with enormous glass walls on other side that illuminate the dining space. From the colorful swirling carpet patterns to the glowing buffet counters, this is a very fun and inviting place for kids. The monorail-taking visitors to other parts of the Disney World resort also passes through the concourse overhead from the restaurant, and it is fun for both children and adults to see this futuristic train making stops on the elevated track above. The monorail is also fairly swift and quiet; so don’t worry that the roar of a train will interrupt your meal! 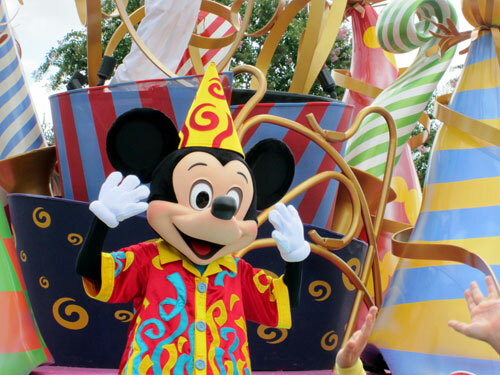 Mickey Mouse is the big star of this restaurant and a visit by the most famous mouse in animation is a guarantee for diners as they enjoy the buffet. Several of Mickey’s pals are also regular visitors to the restaurant, and guests may also see Minnie Mouse, Donald Duck, Goofy or Pluto while they eat. If you are really lucky, Mickey and all of his pals – the “Fab Five”! – may be there at the same time to lead diners in song and a napkin swinging dance during party time. The characters take time at each table to visit with all of the children in each group, and will pose for pictures and sign autographs with each eager young fan (or old fan!) who wants to meet them. For both breakfast and dinner, Chef Mickey’s has an adult and a child’s menu from which diners can select. 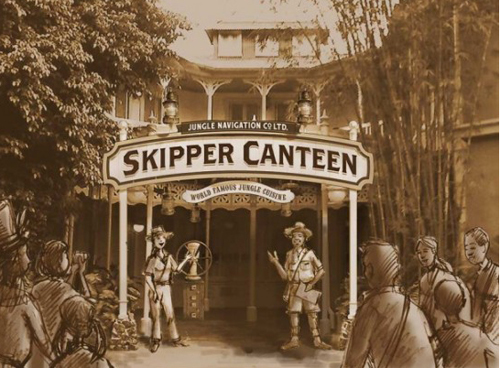 The menu choices consist of fairly standard contemporary American food, with a range of hot and cold choices for breakfast and “meat and potatoes” style options for dinner. The character experience rather than the dining experience is what makes this restaurant remarkable, so the food snobs in your party should not expect to be blown away. Nevertheless, there is a good range of choices on the menu, and the food is generally good quality in spite of its simplicity. The cold breakfast menu includes seasonal fruit, almond granola and variety of other cereals, as well as a selection of pastries such as bagels, chocolate croissants, rice krispies treats, and danishes. Hot dishes can be served from hot plates or made to order, and include options such as corned beef hash, breakfast potatoes, French toast, and buttermilk biscuits with gravy. The chef’s daily omelet will be made to order for each guest and brought out to the tables. Bread pudding is a popular menu item in restaurants all over Disney World, and a warm pudding at Chef Mickey’s makes a terrific break from the more traditional breakfast dishes. A hugely popular item among young diners is Mickey’s waffles, which come in the famous shape of Mickey’s head. For dinner, guests can start off with the soup du jour, or visit the premium salad bar loaded with fresh ingredients. 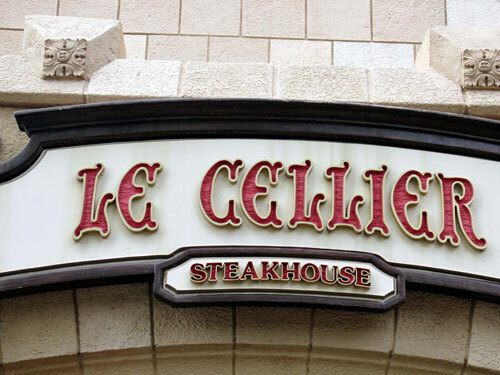 Items on the regular dinner menu include prime rib, turkey pot pie, salmon fillet, and chicken Florentine. On the side, diners can select from parmesan mashed potatoes, glazed baby carrots, green beans, or broccoli florets. Additional items on the children’s menu include Chef Mickey’s macaroni and cheese, Minnie’s mini vegetables, Chip and Dales’s tender chicken, and Goofy’s cheese pizza. A sundae and dessert bar is included with the buffet dinner, if you have any room left! And there are special treats for adults as well who want a drink to accompany their meal. While the children ooh and aah over their character visitors, adults can add something special to their dinner experience with a specialty cocktail, glass of wine or bottle of domestic or imported beer. 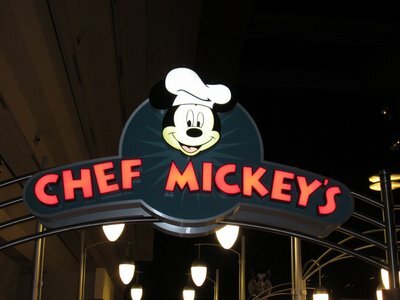 Restaurants in all parts of Walt Disney World are extremely flexible when it comes to accommodating diners with food allergies or other restrictions, and Chef Mickey’s is no exception. There are vegetarian options on the standard menu, and adjustments can be made to make dishes vegan. It is a good idea to mention even minor food allergies when making your reservation, and the restaurant staff can help to advise you about what food options will be available with and without accommodation from the chef.